BUY VITAL CHOICE....The Total Tuna base product! Total Tuna! was created by and for tuna fanatics just like you! Our goal is to deliver the most delicious organic wild Alaskan tuna salad by allowing customers to concoct their own or try one of our fantastic homemade recipes. 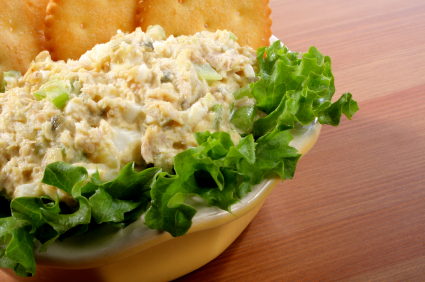 We get that most people have very specific ideas about what constitutes "the best tuna salad." We've all experienced the tuna salad found in most sandwich shops, right? Either way too much mayo, too fishy, not enough veggies, low quality "chunk light" product, and other tuna salad atrocities. To this we say....stop the tuna madness! With Total Tuna! you can select the perfect mix of ingredients (and there will be many to choose from), and add them to what is considered by many as the highest quality organic albacore tuna on the market today. Hailing from the pristine waters of Alaska, Vital Choice®, has to be tried to be believed. BUY SOME right now, and have it shipped directly to your door. As the base product for Total Tuna!, Vital Choice cannot be topped. 100% wild organic albacore tuna (dolphin safe). Sustainably harvested from the pristine waters of Alaska. Low to no mercury detectible due to smaller, younger fish that are troll-caught. Higher in omega-3's vs. traditional brands. Packed either in natural juices with nothing added, or with organic sea salt and organic extra virgin olive oil. It doesn't get any better than this! Gourmet canned albacore tuna, with no worries about mercury found in traditional brands. BUY NOW, and mix it in with my famous recipe below. Mix to desired consistency and enjoy!